Take a tour amidst Heavenly Jerusalem and Earthly Jerusalem – amidst past, present, and future – in the Jewish Quarter of Jerusalem. Where is King David really buried? Who did Rabbi Nahmanides (the Ramban) meet when he arrived in <?xml:namespace prefix = st1 ns = "urn:schemas-microsoft-com:office:smarttags" />Jerusalem? What is a mosque doing next to a synagogue? Where, within the Jewish heart of the city, can we see the ruins of a pagan city? And why do people put notes in the Western Wall? Join us to learn the answers to these and other questions through a fascinating tour of the Jewish Quarter. While roaming around the archeological ruins and modern buildings embedded in the ancient alleyways of the city, we will hear the engaging story of the Jewish community whose members came from far and wide, all of them with a prayer in their hearts for the peace of Jerusalem. We will trace the tracks of tradition, faith, and the yearning for redemption, while we also glimpse the day-to-day lives of the Quarter’s residents. We will learn about the rabbis and the renowned, as well as the regular folk, whose stories combine to create the unique story of Jerusalem. The sites of this tour include King David’s Tomb, the Cardo, Batei Mahse Square, the Broad Wall of the Old City, and the Western Wall. 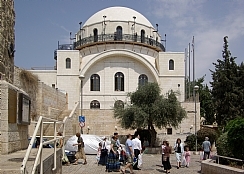 Entrance fees are required for the Ariel Center for Jerusalem in the First Temple Period, the Hurva Synagogue, the Burnt House, and the Herodian Quarter.